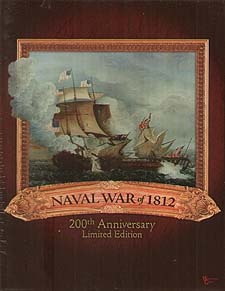 The Naval War of 1812 showcases the global commerce war between Great Britain and the young United States. The goal of the American player is to hunt down British merchant ships while avoiding their warships. The British goal is to seek out the American frigates and merchant ships, while protecting their own. The game includes a hard mounted game board, plastic ships in four colours and cards for ship manoeuvre that depict the strategic and tactical capabilities of the era.